JUICE DIRECT has served customers in the Boland area for many years, and in addition, have been actively servicing customers in the Cape Town city area for the past 18 months with great success. Our Mission is to offer our customers a quality product with prompt and efficient service allied to affordable pricing. We aim to grow a sustainable business, with happy customers who appreciate good service and reasonable prices. We guarantee the quality of our product as we source our raw material from highly reputable and well-known suppliers. 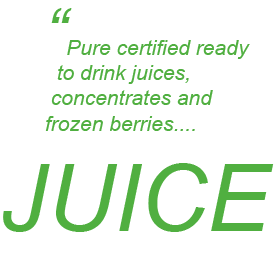 All our juices have a Certificate of Analysis, and this is available to you at any time upon request. Our juices conform to all the relevant Health and Industry regulations. The shelf life of our juices is 4-7 days kept in a fridge, with the exception of Strawberry which is 3 days . Orders placed before 10:00am will be delivered the same day. We comply fully with BEE. We look forward to being of service to you in your business, and our staff await your call. Designed by Webworx Web Design.